I've found the last few days really interesting on the blog and I've deliberately not replied to comments as I think all that needs to be said has been said. But I really appreciate everyone's input, be it positive or negative, and I thank you all for that. But back to normal service. The sheep are due to lamb quite soon. Only one I have seen looks like she is starting to "bag up" where their udders and teats start to grow in size as they come on to milk, a sure sight that a lamb is not too far away. Currently they're still over wintering on some grass my father rents but they'll be back here in a couple of weeks, which means somehow I've got to figure out where we're going to lamb. It's looking like outside and in a 16ft by 12ft lean-to at the moment, but I'm sure I'll manage. 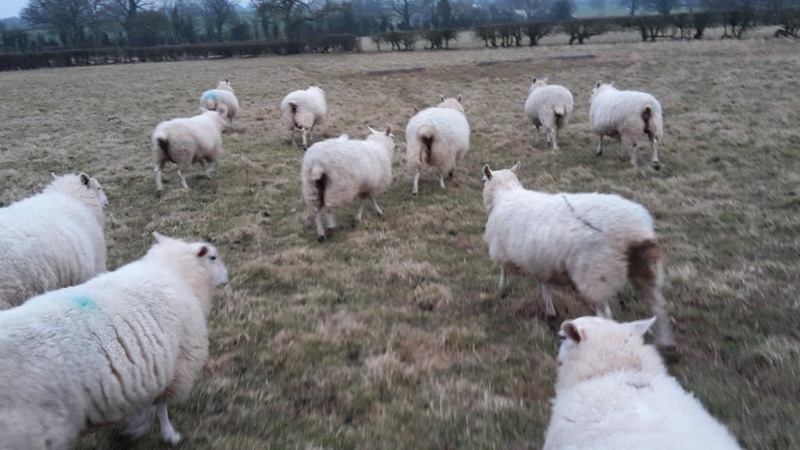 We've been feeding them a couple of buckets of oats per day and they've really gained condition, hopefully it won't have made the lambs too fat (as it makes them harder to come out) but only time will see on that one. Has anyone else ever lambed outside? Perhaps there is some truth in his thinking, lambing outside may seem harsher upon the lamb but perhaps it does sort out the weakest or makes them 'hardier' because they need to be? maybe to do with microbes in the soil? Our local sheep, Herdwicks, usually lamb outside. Living on the fells in summer, they are brought down back end for tupping and spring lambing. No lambs yet but they're looking fat so not far away. When the family farm was at full capacity years ago, first time mums and old mums were inside for lambing. My grandparents said new mums are forgetful and are more likely to orphan lambs, when they spy food or a nice bit of grass. And older ewes steal others lambs, and then decide they arent theirs and the real mum rejects them. Anything to stop bottle feeding. Cows, always in the sheds, they are thicker than sheep. We only lamb inside. Weather around here is violently unpredictable. We sheared yesterday and got a few inches of snow this morning. It was 70 degrees two days ago and below freezing yesterday morning. Besides the protection from the elements we also lock mom and lamb(s) up for a couple of days in private birthing stalls for bonding and such at the end of which we tag and dock the lambs. Last year I ran out of private birthing stalls and had to put a couple of temporary ones together. I noticed several of the ewes were already bagged up while shearing yesterday so it won't be long now. The local French farmers lamb outside - they say it's more hygienic ie lambing onto land that has been frozen over winter. We always lambed outdoors too, but it was a pain when the weather was bad. We do always supply a good shelter and lots of straw bedding.